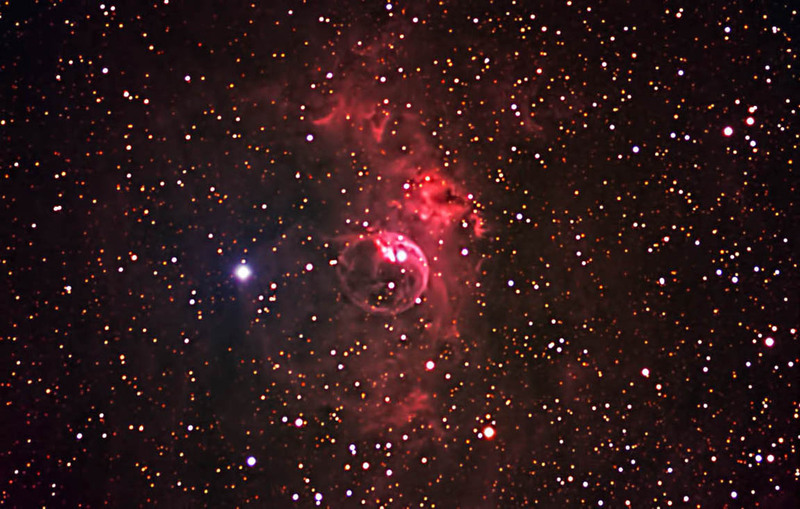 NGC 7635 is commonly known as the Bubble Nebula. It is formed by stellar winds created by a Wolf-Ryatt star (BD+60 2522). First discovered in 1867, Wolf-Ryatt stars are powerful type O stars that begin with 25-50 times the mass and hundreds of thousand times the luminosity of our sun. They produce strong stellar winds as they deplete their outer layers, eventually ending their life in a supernova. The Bubble Nebula lies 8-11 light years away and spans six light years. It is asymmetric because the area nearest the star (located at the upper right of the bubble) is much denser than the other surrounding area. The nebulosity surrounding the Bubble Nebula is Sharpless 162, an HII region. R: 18 @ 5 min. G: 18 @ 5 min. B: 21 @ 5 min. Images were acquired, reduced, aligned, and combined with CCDSoft. Color channels were aligned and combined in RegiStar. The Ha and color images were combined and adjusted in Photoshop. Sharpening and noise reduction was done using Topaz Detail and DeNoise respectively. Taken in my backyard observatory in southeastern Minnesota on 10/19/14.